“There’s two aspects of it. There’s the ‘Buy American’ side, which is basically the government procurement. You have Buy America, which is the grants that go to build bridges and things like that. Over the years, the problem we’ve had is that although we have the laws on the books, our bureaucracy really doesn’t enforce it,” he said. 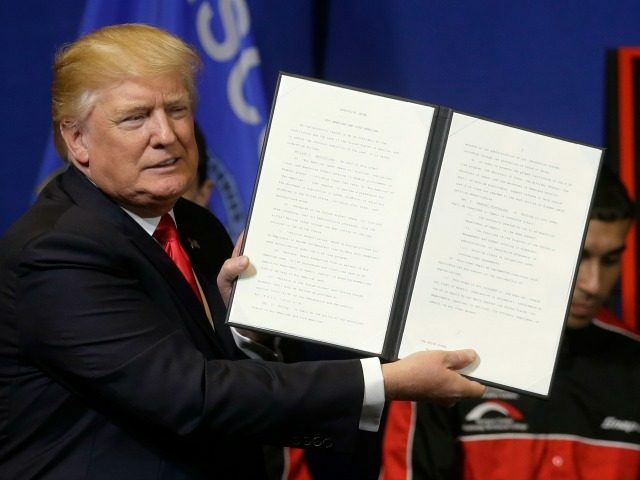 “What we did with this executive order this week – and it was a great, great executive order and a great day for America – we basically change the way the bureaucracy is going to start thinking about this,” he said. “There’s something called the ‘melted and poured standard’ for steel, to treat it as Buy American. We’ve had slippage in that, where steel labs are coming in from foreign countries, often dumped into our markets, and transformed into something else and called ‘American.’ It’s 90 percent of the steel production, so we closed that loophole,” he said. “This is a great way to move forward, building our jobs base. If we get the one trillion dollar package for infrastructure moving, and Congress is going to have to move on that with us, Buy American plus infrastructure is just going to be great for America,” he enthused. Marlow asked Navarro to respond to criticism that “Buy America” is merely a form of protectionism. Marlow asked for the Trump administration’s policy toward the North American Free Trade Agreement, which President Trump has described as a “disaster,” both during his campaign and recently from the White House. Marlow noted there has also been some “intrigue” surrounding TTIP, the Transatlantic Trade and Investment Partnership. He promised there would soon be news on the administration’s determination to review trade deals beyond NAFTA. Navarro said trade deficits “matter a great deal” to the Trump administration. “The best way, in my judgment, to think about the deficit is through the trade deficit in goods because those are the higher-paying manufacturing jobs, the production jobs, that we need basically to rebuild our economy, our manufacturing base, our supply chain, our tax base,” he contended. “And so number one, we need to get that eliminated. We can do a tremendous amount to do that. Number two, and here’s the point I think is lost on a lot of the people who think deficits don’t matter: if you run these things consistently and persistently, at a large amount like we’re doing, we’re basically transferring the net worth of our country to foreigners. Those deficits are basically turned into debt we owe the world, and that comes due in the form of foreigners buying our bonds, our assets, our companies, our homes, our farmland,” he said. “It’s a process that none other than that great arch-conservative Warren Buffett – and I say that tongue-in-cheek – called ‘conquest by purchase.’ When we run these large deficits, we’re basically turning over our country, over time, to the rest of the world. So it’s important to get the deficits down,” he urged. “The other side will tell you, ‘Well, it’s driven by savings and investment patterns, and we save too little, and the Asian countries or whatever save a lot more, so they’re frugal. No. The reality is, if you take 100 percent tariff on motorcycles in India, like we have on Harley-Davidson, right, and you eliminate that tariff and we sell more Harleys to India, our deficit goes down, the savings rate in India goes down, investment flows adjust, and life is better for people in Milwaukee,” he maintained. “You can go chapter and verse through every aspect of our trade deficit and trade abuses and see that if we correct those trade abuses – whether it’s illegal export subsidies, the theft of our intellectual property, or sweatshop labor – if we do that, our deficit will go down, and that will be a good thing,” Navarro promised. Another promise Navarro made was that the H-1B visa program would be reformed. “The executive order we had took a step towards that reform. The problem, as you know, is that we run a massive lottery system for those visas,” he said. “What’s happened over time is you had some big companies essentially be able to basically stuff the lottery box with applications and skew that in their favor – so when the lottery hits, American workers never win the lottery in a way which is good for American workers. Which is to say, the lottery goes to foreign workers that come in and replace Americans, rather than providing the high-skilled workers that we may not be able to get, which is what the H-1B visa program was supposed to do,” he elaborated. Navarro painted a grim “big picture” of how poor trade deals have impacted American culture. “They’re killing hope. They’re killing our manufacturing base and everything in between. That’s what we have to turn around. That $700 billion-a-year trade deficit in goods is essentially the proxy for the decline of the American economy, the American manufacturing base, all the weight and downward pressure that is put on wage growth,” he said. “We have to turn that around. There’s a lot of different ways to do it, but trade reform has to be the tip of that spear. We need tax reform, trade reform, regulatory reform, and cheaper energy. We do all four points of that compass, and we will perform well as a country and an economy. That’s our mission,” Navarro declared.